In the late 60's and early 70's my Mother bought me a new plastic Pakamac for virtually every school year. They were always made from see through charcoal grey plastic. On rainy school mornings, when I got up from the breakfast table, my two Sisters always used to shout together "don't forget your Pakamac!" I am wearing one of my plastic rainmacs at the moment-beautifully smooth and grey, and as see-through as baby pants when the light shines through my beautiful mac. But, much as I love lightweight plastic and nylon macs, I may be purchasing a shiny black rubber mac very soon. At school, when one of us bought and wore a semi-transparent plastic Pakamac, we felt we wanted to tell the WHOLE WORLD, the macs were so beautiful and exciting! When I acquire my SBR mac, I will feel exactly the same. Yes, i do own a lightweight latex rubber mac-a rubber Pakamac of sorts-but this forthcoming rubber-surfaced mac will be my first of this type. I'll keep you all posted!! Thank for your e-mail and your interest! The shop to which I refer is "Cocoon" in Digbeth but, although they usually have a good selection of plastic macs, they do not actually stock nylon macs. It is left to enthusiastic punters like you and me to wear them when visiting there in the hope that the staff get the message!! Their plastic items, which include adult baby wear and leisure wear, are manufactured by PVC-U-Like, and are actually cheaper if you order directly from THEM. Should you require further details of how to get to Cocoon, please e-mail me, and I will provide you with my phone number. Again, many many thanks for your interest. This website is proving to be a wonderful opportunity for contacting the right people, as well as a library of information on Pakamacs. Many thanks yet again and best wishes from Brian. I have bought some of my nylon coated PU macs from Rainmac in Midhurst. I have two red and one navy, they are waterproof and have lovely hoods. I wear them a lot while out if there is any sign of rain. Brian , where is your raincoat shop in Birmingham? Nylon pakamacs were standard issue when I was at high school in the UK and Australia in the 70s. At the girls school up the road all the girls wore them, the younger ones with plastic fold-up rainhats because the macs most often didn't have their own hood, then later on more girls had umbrellas, usually the same shade of navy blue and of course the brollies were nylon as well so the match was poerfect, and they looked wonderful. Some of those girls rode their bikes four or five miles to and from school wearing a nylon mac and a rainhat and still reached the other end perfectly dry. I still say a proper nylon mac is still the thing when you can't use a brolly without makiung a nuisance of yourself, looks better and keeps you drier than those awful cheap plastic ponchos they sell at sports stadiums these days. I too love nylon macs and have quite a collection. Thanks for the acknowledgement. Fear not, I manage to find nylon macs on the high street even now, as my son knows very well. A shame they weren't more prevalent though. I've really enjoyed reading this and the memories of the fabulous Pakamac. I wore a navy blue nylon mac as part of my school uniform in the late 60s/early 70s and regularly at other times. My last memories of buying genuine Pakamacs was in the early 80s. Both were buttoning translucent plastic macs with collars, sadly now discarded. I've continued to wear nylon and plastic macs to this day and I don't mind what the weather nor how cold. Only this morning, extremely cold and snowy, I was well wrapped up inside my navy blue nylon one. The greatest demise is their disappearance from the high street, whether plastic or nylon. They are long due a revival but thank goodness for the internet. Nylon macs are really lovely-all the thrills and excitement of see-through plastic Pakamacs,except that these macs can be worn in any weather. I read of a girl's school, in the 60s, where navy nylon macs were compulsory wearing. One of the girls loved her lightweight mackintosh so much that she became hooked on nylon macs in general. As a lady, she could not pass a shop without buying yet another nylon mac. I bet you would be the same, Anna!! well lets hope that this year we see more of the original "smokey grey" semi transparent Pakamacs,I still love wearing mine and would love to share it with another like minded Pakamac enthusiast,I also love the ladies Plastic macs,but not see a ladies Pakamac for many a year! wish i could feast my eyes on a nice seethru one!! Anns, your comment was lovely and really appreciated. But don't despair-some lovely navy nylon macs are available from "Stay Dry"-just type the name into your search engine. These macs are beautifully swishy and really lightweight, rolling up to that lovely Pakamac size, which we all love so much. You will really love wearing these macs should you order them. I wear them regularly when mackintosh shopping in Birmingham. Also, "suzie high" invariably has some excellent used nylon macs on offer at very reasonable prices. Tyhere is no need for anyone to be without a nylon mackintosh, and I do hope you-and other Pakamac enthusiasts-will follow up these searches. What a lovely website this is turning out to be, with all these Pakamac ideas and comments-beautifully lively and creative. But never forget-LOVE your Pakamacs. Love your Pakamac and your mac will love you. A shame there weren't more such shops stocking nylon macs Brian. good luck. Much though we love Christmas, we are all waiting even more for warmer weather and showers in order to wear our nylon and plastic Pakamacs out of doors. I, for one, will be extending the range of macs I wear, hoping to include some female ones-especially when I visit our rubber/rainwear shop in Birmingham. I always talk to the girl assistant about the mac I am wearing at the moment. Some times she gets slightly annoyed-but we all know where that may lead! I would love her as a regular rainwear partner. Wish me luck!! Pakamacs were so beautifully see-through-they were "girly" macs for boys to wear, and could not fail to excite sexually. The most beautiful pakamacs of all were those of the early 60s-beautifully textured plastic, with a very fine "ribbing" which caused swishing and rustling, driving the wearer wild with excitement. Another facet I loved was the very intense PVC aroma, especially when brand new - vaguely like peppermint. I wish there was some way of preserving that aroma, which would sadly fade after a few weeks. Those collars with the lovely rounded corners...the rubbery buttons with the plastic vinyl stretched over them...the fabulously reinforced buttonholes and pocket openings...the tag inside the collar with the Pakamac logo... you knew, you simply knew that there was no way of being more excitingly waterproofed. I was so disappointed when Pakamacs became matt and non-transparent, around 1980/81 I think. Nothing compared with the traditional see-through smokey grey and smooth PVC of the glory days of the 1950s and 1960s. And those lovely big, rubbery buttons too. Wet days were bliss. I really liked the pacamac style raincoats, but can anybody tell me if they were shiny in the 60s / 70s, or just matt plastic macs ? Wet days were a great joy in my schooldays, seeing so many people clad in their plastic macs, though very frustrating too as my parents obstinately did not buy me a Pakamac then. I agree that they were suprior to other makes of plastic mac. I finally bought my first Pakamac as a student. The wait was worthwhile as I loved the sensual pleasures of watching the raindrops trickle down the front of the mac and listening to the drumming of the rain and the swishing sound as one walked down the street with hands in the pockets to maximise the feel of the soft plastic. It was always a delight to see someone else also wearing a Pakamac, the most alluring being those that were somewhat oversized for the wearer. My dream Pakamac was one that had a hood (which was only for girls' plastic macs back then) and which came all the way down to the ground and had long sleeves that extended beyond my fingers. Thanks to Ebay, I finally fulfilled that dream and now love the downpours more than ever. Oh the joy of the original pakamac. Have always loved wearing such an item and love seeing other guys wearing them as well. Takes me back to schooldays when they were so popular and we all wore them to keep the rain off. Such a shame they died out and are so very hard to find now. The demise of Pakamac and Woolworth's with their one time plastic macs was a great pity. Somehow a woman wearing a plastic mac only because it is raining is sexier than a model exageratedly posing to be deliberately provocative. I've loved plastic macs for about 50 years,frequently take one with me wherever I go and have had much fun writing stories/painting pictures on the subject. I must not wear other boy's plastic macs. At primary school, I had always loved girls in their semi-transparent, see-through, plastic mackintoshes, in pale colours-pale blue, pale pink, yellow and so on. But imagine my ecstasy when grey-black see-through macs appeared-FOR BOYS!!!! And many of them bore the wonderful name we are celebrating on this website-PAKAMAC!!! I fell in love with them straightaway, and my present wardrobes of male see-through plastic macs have always been central to my rainwear enthusiasm. Or should I say fetishism or even perversion? I am wearing a lightweight nylon mackintosh whilst typing this and it just will not stop swishing and rustling-I feel about to EXPLODE!!!!! My new mackintosh arrived today-a lovely navy blue plastic mac in the best Pakamac style and traditions. I am wearing it at this very moment, and I am all blown up with excitement, the type of excitement which only rainwear lovers can appreciate. This will be a lovely mac to wear on my visits to our rubber/rainwear shop, to impress the lovely girl assistants, one of whom can be quite raunchy! I am always hoping she will lock the door, put on of the baby-pant see-through macs they have in stock, and let things proceed logicallly to their conclusion! Lovely to see so many people interested in plastic macs(=Pakamacs. And I have more wonderful news-I have just ordered another one-male, navy blue, rubbery-just the way I like them. I AM ALL PUFFED UP WITH EXCITEMENT!!! My message to all of you is to LOVE YOUR PAKAMACS whether nylon, plastic or rubber, and don't just wear them in the rain!! LOVE THEM AND ENJOY THEM!!! One of my many Pakamacs is a navy nylon mac with a rubbery PU lining. Yesterday I visited our local rubber/plastic fashion shop. I wore my nylon mac, all buttoned up, on going in. My mac made me quite hot inside, but I didn't mind. Whilst choosing my purchases, I swished and pulsated my rubbery mac, and my mac puffed up beautifully. As I handed my garments to the girl assistant, I felt as good as I looked. A pleasant afternoon's diversion(and yet another pair of plastic pants to my collection!) Yes, nylon Pakamacs can be as exciting as plastic Pakamacs. It is so beautifully exciting to be a rainwear enthusiast! hoe I love wearing plastic macs,I still have 2 gents Pakamacs which I wear often and would love likeminded folk to share them with me! Until I found this site I thought I was the only boy to enjoy wearing a pakamac. Not so! I would love to wear a black transparent pvc/plastic mac even now. Also are there any women out there willing to shake me?!! when I was a boy of 10 in the mid 60s, I loved wearing my black see through plastic mac.I would go to my bedroom "to read", but it was an excuse to wear my mac in private. If I ever played out in it, I used to ask one girls down the street to give me a good, hard shake! Dont know why even now,but I loved to be shook violently in my plastic mac, and she always obliged. I also shook my mac dry after a shower, but I was always still wearing it! I wish I coild get hold of a plastic mac now in a local shop. Pakamacs are simply lovely, and it is always a pleasure to write about them-indeed, I could write books about them and people who wear them. Although I am a fully committed rainwear enthusiast, enjoying nylons and rubber macs too, it is always the basic grey-black, semi-transparent, unisex, lightweight, roll-up plastic vinyl mackintosh that is so central to my enjoyment. and I wear them more than any other rainwear item. How about forming a Pakamac Society? I still love wearing my pakamac,i have one that is like new which I only wear now and then,i would be lovely to walk in the rain with like minded folk wearing our plastic raincoats! Within the last few minutes I have bought, on-line, yet another plastic Pakamac, lady's see-through, sky-blue. I am just out of my mind with love of plastic macs!!! Plastic Pakamacs are more than a convenlent way of waterproofing the wearer-they are even more than beautiful and exciting garments to wear-they provide a wonderful way of ENJOYING rainy weather!! there is no better sight than a mture lady or gent wearing their original plastic macs. To a rainwear enthusiast, "Pakamac" is almost the sexiest word in the English language, surpassed only by the two words, "Plastic Pakamac". Let's have more waterproof "cameo2 remarks in this space, and let's try to get these macs in production again!! Who knows!! These lovely grey-black see-through macs started my mac enthusiasm in the fifties-and I have never looked back!! Still the best plastic macs ever made, beautifully see-through. At school, we boys loved them, some of us having two or three. Please let's have them back!! 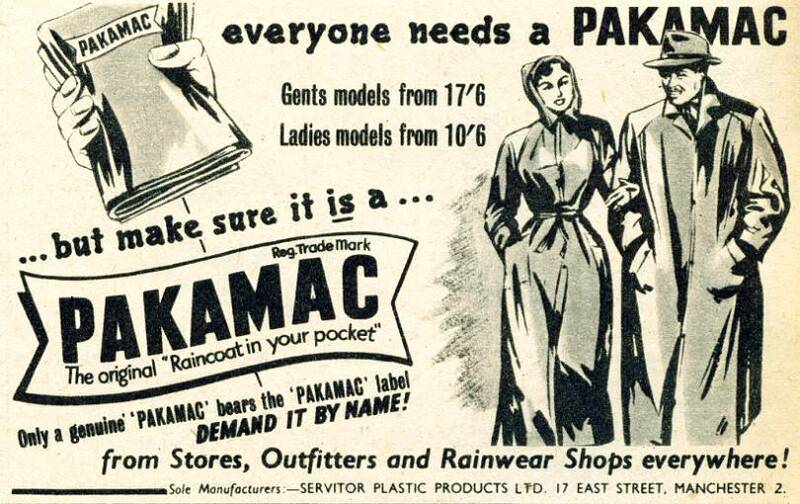 mmm wish they still made these,we shall need a revival of pakamacs with the wet weather!